Reference number for this case: 29-Sepr-54-Saint-Pierre-le-Moutiers. Thank you for including this reference number in any correspondence with me regarding this case. 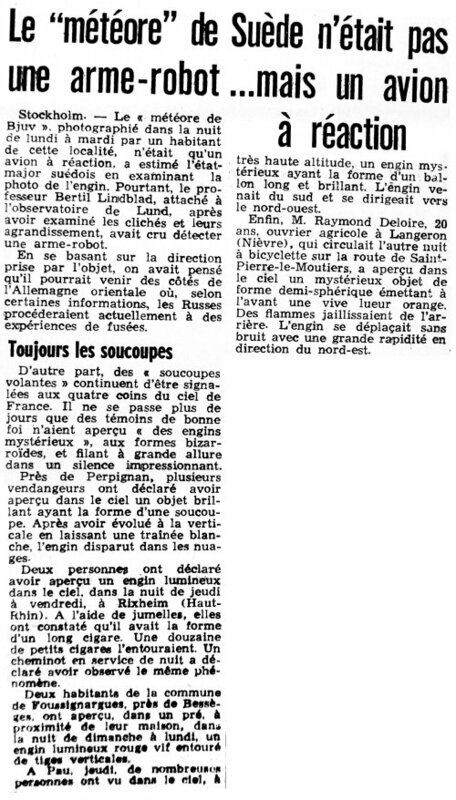 Aimé Michel noted a number of sightings on September 29, 1954, and says there was one in Langeron, dans la Nièvre. He indicates that after night fall, Raymond Deloire, aged 20, son of the guard-forrester of Langeron, was riding his bicycle on the national road 151a from Saint-Pierre-le-Moutier, when he saw in front of him in the sky, coming from the west, an object of hemispherical shape, of bright orange color, traveling horizontally in silence. The young man followed the object with the eyes and saw it disappear over the horizon to the northeast. Aimé Michel said that if one observes the direction of the road, it appears that the object passed north of Langeron, that is to say in the direction of the line followed in other observation at this date and time, and that the object has disappeared precisely along the line, but it was going in the opposite direction. As the description also differs, he feels that it was not the same object. 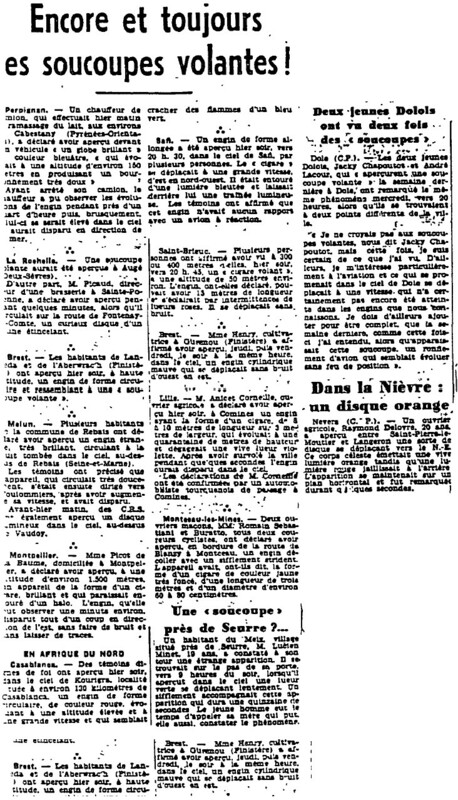 He indicates his source is the newspaper France-Soir, for october 2, 1954. 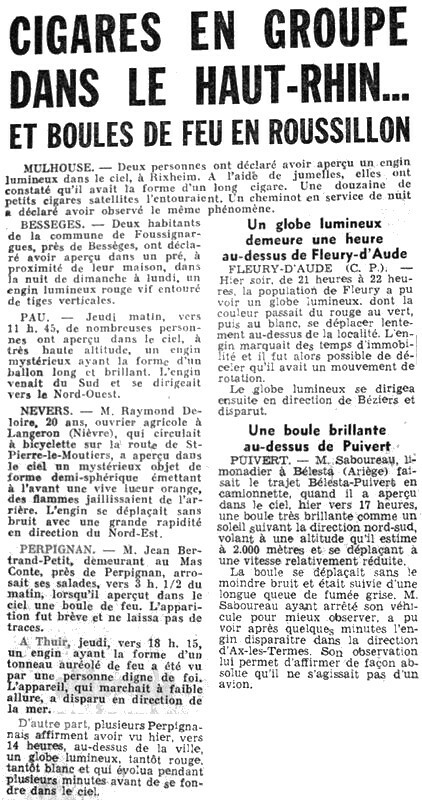 Luc Chastan indicates that in the "Nièvres" in Langeron on September 29, 1954 at an unknown hour, "The witness rides a bicycle as the night fell on the N151b coming from St Pierre le Moutier. He sees arriving opposite him from the west a luminous object of hemispherical form of orange color which slipped by horizontally in silence. The object disappeared at the horizon towards the north east." The website indicates that on 29 September 1954 at 21:00 on the N151, near Langeron, France, "Silent orange hemisphere goes W to the northeast over horizon." "An unidentified object was sighted, but with appearance and behavior that most likely would have a conventional explanation. One orange dome-shaped object was observed by one witness on a farm for over one minute (Deloire). No sound was heard." Saint-Pierre-le-Moutiers, Nièvre, Raymond Deloire, farmer, Langeron, half-sphere, orange, gleam, flames, silent, fast. [am1] "Mystérieux Objets Célestes", book by Aimé Michel, Arthaud publisher, France, pp 135-136, 1958. [am1] "Mystérieux Objets Célestes", book by Aimé Michel, Seghers publisher, France, pp 135-136, 1976. 1.3 Patrick Gross October 24, 2011 Addition [in1]. 1.4 Patrick Gross September 30, 2014 Additions [am1], [ub1]. Explanation changed from "Not looked for yet. Probable meteor." to "The September 29, 1954, meteor, about 08:30 p.m."